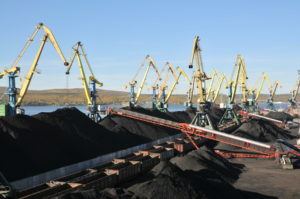 The State Transport Leasing Company (STLC), set up by the Russian Ministry of Transport to control the development of the Russian transport industry, is seeking a strategic investor for the construction of the coal terminal “Lavna” at the northern port of Murmansk, informs TASS News Agency. Lavna coal handling complex is a green field project being developed on the western coast of the Kola Bay, vis-a-vis the Murmansk port. A deep-sea terminal (draft 20m) with 2 berths of total length of 636m will have a designed capacity of 18 mln tons per year. The ice-free port of Murmansk has a direct access to the Barents Sea and can handle vessels with a capacity ranging between 20,000 and 150,000 DWT. A 46 km railway line Vykhodnoy-Lavna is currently under construction with the expected completion in 2018. The line will connect Lavna with the Russian Railways network and will facilitate the delivery of coal to the port. The whole project is part of the grand federal program called “Complex development of Murmansk transport hub” with the budget of RUR 132.2 bln (apprx. USD 2.3 bln by current rates), of which 60% are to be invested by private companies. The program is said to be completed by 2020. To participate in the Lavna terminal project, the investor is expected to acquire a 75% stake in the project company Lavna Sea Commercial Port, which is assessed today at RUR 930 mln (USD 16 mln). The investor will also sign a take-or-pay contract that will guarantee the cargo base for the facility and reimburse the project company for the capital costs of the construction including loans interests and taxes. The contract implies monthly payments and is signed for 10 years since the launch of the coal terminal. The investor will get 100% of the terminal’s capacity, which is 18 mln tons annually. With all its advantages, Lavna has been struggling in finding investors since the start of the project in 2009. Originally, the terminal was to be developed by Kuzbassrazrezugol (KRU), one of the largest Russian coal mining companies. But in 2015, following the sharp ruble devaluation in 2014, KRU pulled out of the project contesting the forecasts of cargo volumes to be exported via Murmansk. Then, STLC picked up the development and has been searching for investors. In early 2017, there came the news that the Chinese Poly International is interested in the project and may provide USD 300 mln, but obviously no deal has been signed up to now. Later, at St. Petersburg International Economic Forum in June, STLC signed an agreement of cooperation on the Lavna project with Swiss-based MERCURIA Energy Trading S.A., but no further details were disclosed.